The exhibition Radical Transformation: Magnum Photos into the Digital Age. Image courtesy of Harry Ransom Center. The symposium has now wrapped up. Too quickly really, I for one could have enjoyed this day and night for another week. 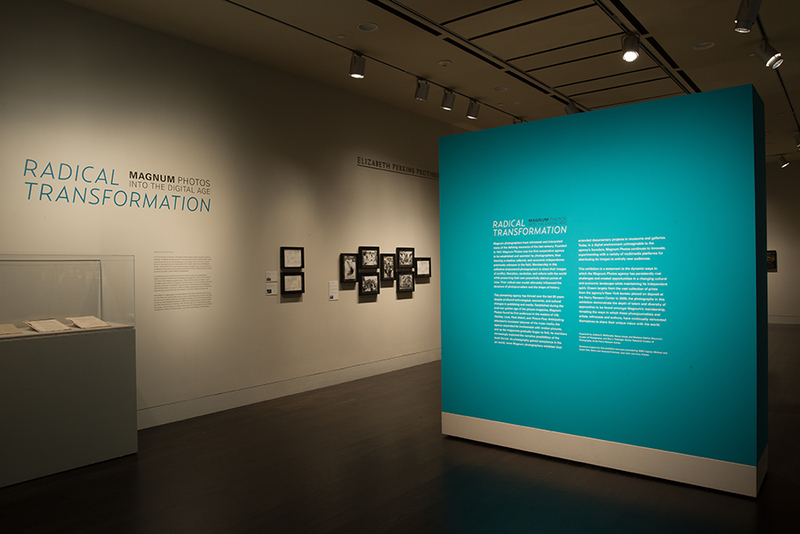 A monumental feat for Jessica McDonald, Roy Flukinger and the Ransom Center staff to bring such an enriching accompaniment to the exhibit, Radical Transformation: Magnum Photos into the Digital Age is on display until January 5th. The issues raised and discussed during the symposium directly reflect each of the photographer’s particular fields of work, as well as the particular concerns of those of us who practice and love photography. But it is more than that. Imagery, and our understanding of it, shapes history. From personal histories, documentation of rarely seen cultures, to world events, photography is shaping historical consciousness. How it is made, how much of its language is understood, how it is preserved are issues that have been altered greatly with digitization of photography. The slow transition it has made into our cultural lexicon may seem like natural evolution but the implications are monumental. How Magnum navigated and continues to navigate these waters will now be available for future study. So besides the rock star status these image makers hold, the issues they grapple with and how they have creatively addressed them, can guide us through a tumultuous process when confronting the issues ourselves down to the smallest scale. Magnum, for generations now, has flourished. While continuing to maintain a high caliber of incoming members, it is the pioneering and creative philosophies that have kept it strong. Gripping images, innovations, and how the work could be placed in the context of life and history are integral components of the Magnum philosophy. After the keynote address and four panels, I am struck with not just that this is their personal philosophy but it is how they function as an entity in total. I am left with the impression that over time they have embraced the changes, and continually morph them into useful tools as any great artist might. When most people are screaming and running to the hills saying photojournalism is dead, they innovate and adapt with force. Friday night Fred Ritchin started off the symposium with a comprehensive, concise and riveting keynote address. Ritchin is the professor of Photography and Imaging at the Tisch School of the Arts, NYU and Co- Director of the Photography and Human Rights Program. He gave a thorough survey of the effects digital technologies has had on our news media, from its inception to present day. He started out discussion with a 1982 National Geographic cover image altered slightly to fit the vertical cover better. He ran through examples of digital alteration throughout the 80’s and 90’s, landing on the recent world press award controversy in regards to Paul Hansen’s funeral photo. The lack of strong industry standards when clearly marking alterations of images used in news lead to a loss of confidence in the image, especially as we turn to a more enhanced drama in our news sources. He also pointed out the repetition and oversimplification of imagery occurring today with our use and understanding of digital effects. We are like someone driving 90 miles an hour looking in the rear view mirror. We do not understand the direction we are going exactly. Ritchin also reviewed the concept of citizen journalism and he stated that the Abu Ghraib photo is arguably one of the most poignant of our times. He ventured into our unknown future with the advent of Google Glass and soon Lifelogging. This is just touching on the surface of the comprehensive survey given by him and I am surprised he was able to fit it all in 45 minutes. What all this means in the times ahead will be revolutionary. Each panelist spent about twenty minutes discussing their individual work and how it related to the topics presented. After each completed speaking they sat together fielding moderator questions and then questions from the audience. Chris Steele- Perkins looks to do more than parachute into a place or be a “war photographer”. He spoke of the extended story, digging in for more meaning and finding the cultural context surrounding war as more important to his work. He has found the book to be the platform that works best for him. Even stating he does not believe in the photo story. As it is, a few images get plucked out of the larger story versus a book publication that can support the full context. He spoke also of exposing misconceptions of other cultures and people. I was impressed with his description of how he develops a portrait of a place. He is utilizing small vignettes, building on details he can’t get out of his mind that become descriptors of a larger story. Making his images to not necessarily push a point of view but to give an idea of what it felt like to be there. Chris Anderson is now New York Magazine’s first and only photographer in residence. He has ventured into various platforms developing a version of his book Capitolio for the iPad. He describes his style as emotionally charged, experiential photography. He feels there has been some experimentation with the new platforms but that it can be pushed much further and has vast possibilities we have not seen yet. He also touched on some interesting ideas about the digital realm not just affecting how photographers produce work, logistically and otherwise, but the way in which we collectively see and process the information. Jim Goldberg and Alec Soth both talked about their Postcards project and the importance of having a model that is conducive to inspiration and collaboration. As it has grown they have been able to create new avenues and materials afterwards. that Magnum has found for giving back and which is helping fulfill the needs of growing photographers and undeserved stories across the world. I’d love to relay more comprehensive review from the all of the speakers but the volume would be too large. Part of what is so great about the symposium is having them all here at one time in discussions together. Some of my favorite moments were just seeing them, old friends not having seen each other for who knows how long, meeting up again here in Austin. A rare treasure.